In many ways the defeat of the Spanish Armada in 1588 can be seen as the apex of Elizabeth’s reign – the Armada Portrait shows that God was definitely on her side and that in addition to reigning over England Elizabeth also ruled the waves and other parts of the globe – the latter can be seen from her proprietorial grip on a globe whilst the former is manifested in the carving of a mermaid on her chair – admittedly the artist had to do some reworking as the traditional symbolism of a mermaid was the opposite to that which usually depicted the Virgin Queen’s qualities. It wasn’t long before Fortunes wheel began its downward cycle for the raging monarch. The Earl of Leicester died on his was to take the waters in Buxton. Elizabeth, retired to her chamber to grieve and refused to come out. After the doors to her bed chamber had been broken down on the orders of Lord Burghley, the queen did not display much in the way of magnanimity to the widow -Lettice Knollys. Instead she pressed for Dudley’s debts to the Crown to be repaid. The irony cannot have been lost on Lettice. Dudley had mortgaged Kenilworth, Leicester House in London and Wanstead to finance the campaign in the Netherlands. At court the power dynamics changed without Dudley in the mix. Sir Christopher Hatton rose in seniority whilst Dudley’s step-son the earl of Essex became engaged in a bitter battle for supremacy with Sir Walter Raleigh. Elsewhere radical Puritans made their voices heard and when Sir Christopher Hatton tried to silence them with laws of blasphemy the Queen found it politically expedient to be equally harsh to her Catholic subjects. The war against Spain continued to drain the treasury. The Irish revolted. The Jesuits sent more agents. Harvests failed, prices soared and there was an out break of plague. There were butter and fish riots. Unsurprisingly there were one or two plots – including that of Dr Lopez- the queen’s own physician. Lopez as well as being a physician had also spied for both Walsingham and Dudley – now those particular chickens came home to roost when the Earl of Essex accused Lopez of plotting. Lopez paid the price for playing the role of agent provocateur and also of Essex’s campaign to overthrow the Cecils. The Earl of Essex was no Dudley -ultimately Robert Dudley had loved Elizabeth. He and William Cecil might have cajoled and flattered on occasion but they knew that trying to bend the queen to their wills was not something to be undertaken lightly. They did not see her as a mere woman – Essex on the other hand rather over rated his own appeal and powers of persuasion. And what was worse he ignored Elizabeth’s commands, returned from Ireland without permission, burst in on her when she was not rigged out in the full Gloriana costume and told her that she had a crooked carcass. It was not behaviour designed to win friends and influence people. Defiance by Essex turned into rebellion. After the Earl of Essex went to the block Elizabeth did her very best to appear as though she was neither aging nor tired but she stumbled when she got out of her coach at the opening of Parliament, was more bad tempered than in the past, ate little, suffered from arthritis and was prone to melancholy. It didn’t help that all her old friends and servants were dying one by one. Her fear of the darkness grew and she struggled to sleep more than a few hours each night – all of which is a bit of a contrast to the monarch bedecked in ribbons and pearls with her hand on the world. David Cecil, William’s grandfather had turned up at Bosworth on the victorious side. he went on to become one of Henry VII’s newly formed yeomen of the guard. His son meanwhile settled down to the business of being a Lincolnshire gentleman with court connections. William, born in 1520, went to Grantham Grammar school and then onto stamford Grammar School and from there to Cambridge where he blotted his copy books by falling in love with, and marrying, an inn keeper’s daughter. Mary Cheke- William’s youthful fling died in 1544, two years after their marriage. They had one son with whom William appears not to have got on very well all things considered. The son, Thomas, did not have the same administrative brain as his half-brother Robert. Cecil is supposed to have said that Thomas wasn’t fit to govern a tennis court, not that it stopped him from becoming the 1st Earl of Exeter. In 1545 William married Mildred Cooke. Two years later William became part of the administrative department for Edward VI’s protectorate. He had been at university with Ascham. Rather unexpectedly William turns up at the Battle of Pinkie and seems to have got on well with the Duke of Somerset as he became one of his private secretaries. 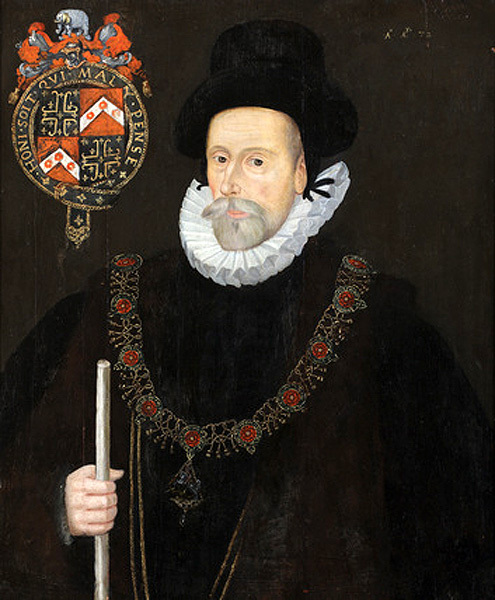 Unfortunately Somerset would fall from power in 1549 – the resulting associating meant that Cecil got to spend some time in the Tower on the wrong side of the bars but on his release he became the secretary of John Dudley, Duke of Northumberland. It was during this time that he became Elizabeth Tudor’s man of business or more specifically her estate agent. Then Edward VI died and Cecil found himself on a sticky wicket once more. He was part of the regime attempting to usurp Henry VIII’s will and place Lady Jane Grey on the throne rather than Mary Tudor. He managed to extricate himself by signing the device which made Jane queen as a witness and Mary Tudor issued him with a general pardon suggesting some shady doings which helped to thwart Dudley. During Mary’s reign Cecil was sent on a couple of diplomatic missions and continued in his role as a member of Parliament. His wife’s convinced Protestantism doesn’t appear to have held him back. In 1563 he purchased Theobalds House in Hertfordshire. Much has been written about Cecil or Lord Burghley as he became in 1571. It was he who sought to send Robert Dudley as an Ambassador to Spain shortly after Elizabeth ascended the throne, it was he who was sent from court in disgrace after the execution of Mary Queen of Scots and it was he who helped to re mint the coinage to make Elizabeth’s economy much more secure. He did become Lord Treasurer in 1572 after all. Whilst much is made of Elizabeth’s foreign policy which often seems to include marriage negotiations involving either herself or in later years Arbella Stuart or on occasion the grand-daughters of Lady Margaret Clifford it was Cecil who initially recognised the importance of the New World in terms of economy and it was he who identified the importance of playing Spain and France off against each other in order to maintain a balance of power. Cecil like Elizabeth was keen to avoid a war. In short he was there to protect Elizabeth and the realm by always being in the background organising that things went as smoothly as possible. Alford suggests that Cecil was much more than an administrator. It was Cecil who put Sir Francis Walsingham in post in 1568 and he seems to have had a knack for plots and double agents of his own. Aside from plotting, administration and a Renaissance line in poetry writing, Cecil also enjoyed, of all things, gardening. He employed John Gerard who wrote Gerard’s herbal and the enterprising Tradescants were employed by William’s son Robert. It was tradescantia who popularised tulips in England. Which leads me to my happy discovery of the day pertaining to Cecil, Elizabeth I and gardens. In 1599 Sir John Davies described Elizabeth I as the Empress of Flowers who prized a beautiful garden. This in its own turn meant that Elizabeth’s chief courtiers were green fingered themselves – or at least employed some rather good garden landscapers. Robert Dudley and William Cecil competed with one another to produce gardens that would impress. Cecil liked “fountains and walks” in his gardens and imported lemon trees as well. He also had a maze garden. The designs became ever more ornate as he tried to outdo Robert Dudley who pulled out all the stops in 1575 at Kennilworth. I must admit to loving the idea of a garden rivalry! Sir Francis was born in Oxfordshire in 1511. His father died when he was seven but he gained a position at court thanks to Henry VIII who showed him the same favour with which he’d regarded his father. He is perhaps best known as Mary Queen of Scots gaoler but he appears at keys moments throughout much of the Tudor period. For instance, he was one of the gentlemen who met Anne of Cleves on her arrival in England; he was an MP; a soldier during the Rough Wooing; a friend to Princess Elizabeth and Robert Cecil; husband of Catherine Carey (Elizabeth’s cousin via Mary Boleyn). There is, of course, the possibility that Catherine Carey was not simply Elizabeth’s cousin but also her half-sister but there is insufficient evidence to draw any satisfactory conclusions. It is however safe to say that Sir Francis was close to Elizabeth. His wife was a good friend of the queen’s as well as being a relation. So close was his relationship that Sir Francis was able to express his belief that keeping the Scottish queen in England was a disaster. As a determined Protestant his career suffered a severe reverse upon the accession of Mary Tudor. He was such a determined Protestant that he went to Germany rather than live under Catholic rule. Unsurprisingly his career resumed once Elizabeth ascended the throne. In addition to becoming a privy councillor he also resumed his parliamentary career. He worked for the queen in Ireland and received jobs within the queen’s household such as Treasurer. The image shows Sir Francis holding a white staff showing his role as officer in the queen’s household. In May 1568 Mary Queen of Scots arrived in England. Knollys was sent north to act as her gaoler. His reputation as puritan made him naturally suspicious of the Scots queen. However, her charisma soon won him over, though he never let down his guard while he had care of her in Carlisle Castle and later in Bolton Castle. In fact he was so worried about security that he sent the plans of Bolton Castle and his security provision to Cecil for approval. He taught the queen English and read the English Prayer Book with her as well as discussing his faith – a matter which caused Elizabeth to write a letter chastising his behaviour. On January 20th 1569 Knollys received orders to take Mary to Tutbury Castle and hand the royal prisoner over the Earl of Shrewsbury who would take over Knollys’ role of gaoler. Sir Francis remained with Mary until February when his wife died. Sir Francis died in 1596 after a long and illustrious career as a politician and adviser to the Tudors.